Parkside had a different feel during this simpler time. There wasn’t a street in the neighborhood without a business of some sort. In many homes, the front parlor served as an office for doctors, dentists, and lawyers, and as a workshop for dressmakers, tailors and even a furrier. And that was just the businesses in the homes of the professionals. The Main Street ends of both West Oakwood Place and Greenfield Streets were dotted with businesses. On the first block of West Oakwood Place, in 1940, there was a grocer, Beatrice Foley selling gifts, Frank Nashek selling furs, a dry cleaning company, and the Jean Alma Beauty Shop. In 1950, Greenfield Street had Joe Mobilia’s shoe repair shop, Abe Kramer the tailor, George Meyer’s grocery, Frances Wolkiewicz’s variety store and Klein’s Delicatessen. In 1930, 11 Greenfield Street was home to Flickinger’s; one of the original small shops that would grow later into the Super Duper chain. Flickinger also ran a grocery store at Parkside and Russell, a corner that through much of the neighborhood’s history has also been a traditional business strip. In 1930, there were 4 stores listed as grocers near Parkside and Russell. As Burt Flickinger and family were looking at their Parkside businesses and thinking bigger, one longtime Russell Avenue grocery was thinking on a small scale; a small scale that would serve it well as a Parkside institution for 50 years. 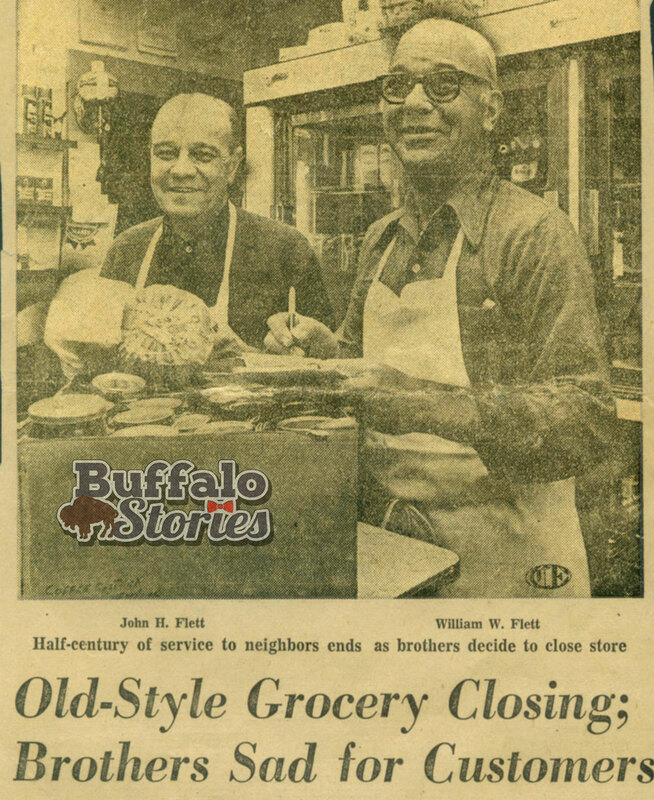 From 1924 to 1976, the Flett Brothers, Jack and Wally, were literally at the beck and call of Parksiders and North Buffalonians for their grocery needs. While a shopper could walk into the store to shop, it was one special service that the Flett’s kept up long past any of their competitors that kept customers coming. Long into the era of chain grocery stores, like those pioneered by their one time neighbor Burt Flickinger, Flett’s delivered on orders their customers phoned into the store, usually on old fashioned tab credit. Jack would fill the orders as they came in, and Wally would drive the delivery truck, carrying your groceries to your front door, and even your kitchen table. Wally and Jack Flett, inside their store, after it was announced they’d close in 1976. Wally drove the delivery truck, and Jack would put the orders together called in by servants or the women of the various homes not only around Parkside, but all over the city, and as far away as Williamsville in later years when Flett’s was the last grocer to still deliver their goods. Ironically, the site of the current grocer on Parkside, wasn’t the site of one of the dozen or so grocers in the neighborhood over the years. Before Wilson Farms stood on Parkside, the lot was the home of a Hygrade (and later Gulf) filling station and garage from the 1920s until 1976, when the current building was erected. It’s fondly remembered by generations of Parkside kids as the place to fill up bicycle tires at the always free air pump. While many kids made their first dimes working at the area grocery stores, a very young Bob Venneman worked at a different Parkside landmark. He was a stock boy at the Fairfield Library, at Fairfield and Amherst Streets. On payday Friday, he’d go to Unterecker’s (later The Stuffed Mushroom, then Shawn B’s, at Main Street and Orchard Place) for a 15 cent ice cream sundae. He quit that job with the depression hit and his pay was cut back to 19 cents. The Fairfield Library, opened in 1925, and shutdown by the Buffalo and Erie County Library in 2005, was designed by Parkside resident William Sydney Wicks. Originally Parkside Unitarian Church when the doors opened in 1897, the building is considered one of the area’s finest examples of New England Colonial architecture. In 1912, the building became the home of the Parkside Evangelical Lutheran Church. A dozen years later, in 1924, the building was purchased by the city and opened as a library in 1925. The building was enlarged in 1961 to accommodate more books, but the Fairfield Library was closed but the Buffalo and Erie County Library in 2005 in the midst of an Erie County budget crisis. When built, it was one of many churches to be built in the Parkside neighborhood as the community grew. 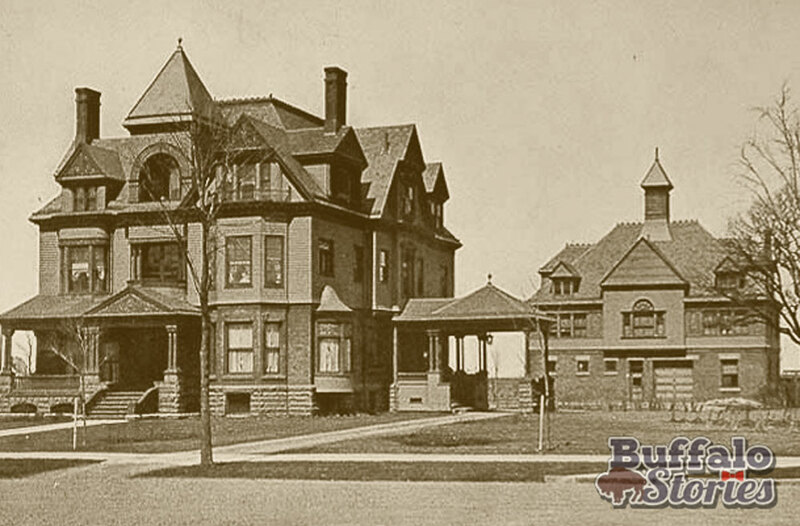 Bennett himself had a magnificent 24 room home (right) built at 354 Depew, which was later razed and replaced by 12 lots. 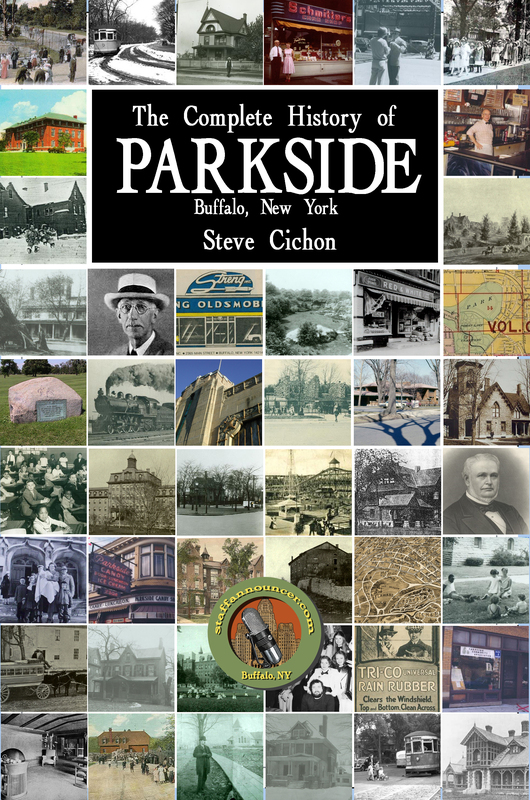 The church was built by the man greatly responsible for developing Parkside’s neighbor to the north; north of the Beltline tracks, that is. There lies the Lewis J. Bennett-designed and developed neighborhood Central Park. 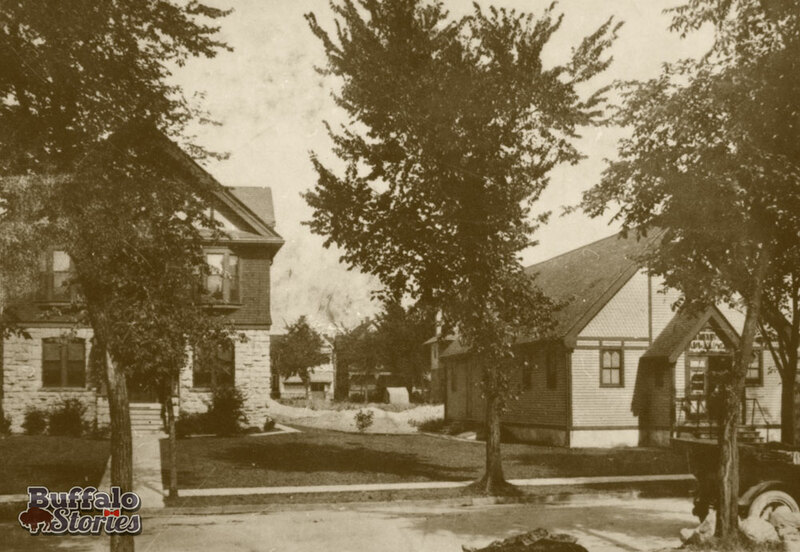 The owner of Buffalo Cement began planning the neighborhood in 1889, taking four years and $300,000 to lay out streets, plant 1200 elm trees, blast out bedrock, and built the four stone markers to delineate the original boundaries of this exclusive neighborhood. Strict zoning ordinances set forth by Bennett called for homes of at least 2 stories, with barns in the rear of all residences. Specific price structures were also established, with homes on Depew to cost a minimum of $4000, on Main Street $3500, and on Starin, $2500. A vice-president of Pierce-Arrow, Mr. Henry May, lived at 290 Depew Avenue. Many Parksiders and Central Park residents became used to Mr. May driving through the streets of the neighborhood on a drivable chassis without a body, working out the kinks in the latest Pierce-Arrow models before they went to production. The train station at Starin and Amherst belonged to the Buffalo Cement Company and was leased out to the New York Central Railroad. Once the Beltline discontinued service in the 20’s, the station was sold to the Boy Scouts and used as the headquarters for Troop 12 until well after World War II. The structure remains the last standing station house that served the Beltline railway. Indirectly, Bennett also played a role in the development of Parkside, but mostly by his unwillingness to accept a Roman Catholic church into the community he was developing. 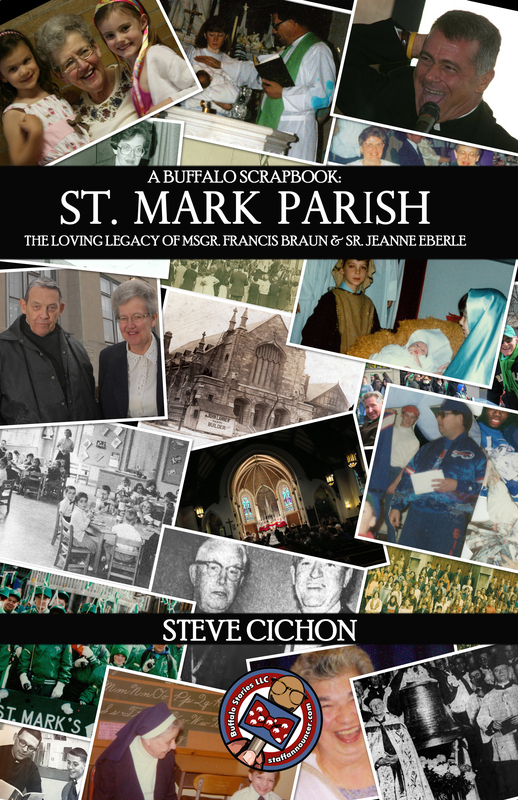 In 1908, Buffalo’s Catholic Bishop, Charles Colton, wrote of his desire to start a new parish in “the Central Park area of Buffalo,” either to be called Epiphany, or St. Mark’s. Bennett had reserved triangular islands of land throughout Central Park, upon which churches were meant to be built. Parkside Lutheran, for example, is one those “churches on an island,” where Depew Avenue, Wallace Avenue, and Linden Avenue all meet. 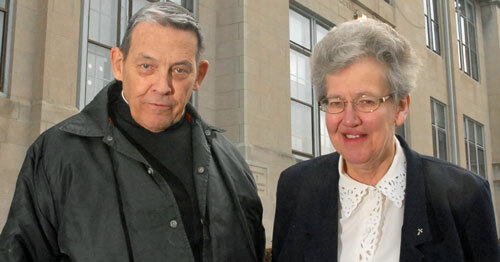 The people of St. Mark and the Buffalo Catholic Diocese inquired about one such island, at Beard, Starin, and Morris. Developer Bennett, whose own strong Unitarian views were greatly at odds with Catholicism, refused to allow a Catholic church on his property, or anywhere in his Central Park development. Fearing similar responses to overtures across Amherst Street in the Parkside Neighborhood, the founders of St. Mark’s went cloak and dagger, and perhaps by stretching the truth in a few places, were able to buy several lots only two blocks away from that initially desired triangular lot, this one at Woodward Avenue and Amherst Street. St. Mark’s first church, a small wooden structure, was constructed in the summer of 1908, where St Mark’s School now stands. More specifically, the church was where a hedge now stands in front the school on Woodward, parallel to the northernmost wall of the school building. The building to the left predated the church, but is currently serves as the rectory, enclosed in the same stone as the church. A very young priest, Fr. John McMahon, was offered the chance to become pastor of the parish. His background as pastor at Mt. Carmel Church would serve him well. Mt. Carmel was down near the Commercial Slip in Buffalo’s rough and tumble waterfront /canal district, right next to where the Crystal Beach boat would dock. The area, known as “The Hooks” in those times, was filled with interesting characters from many different walks of life, while Parkside and Central Park were still greatly undeveloped. It was many of these rough and tumble sorts who made up the 30 or 40 families who started St. Mark’s. The families were mostly those of men who were dockworkers at the commercial slip at the canal terminal. There were also 70 or 80 servants, virtually all Irish, among the congregation. They were the maids and butlers in the larger Parkside and later Central Park homes. St. Mark was a mostly Irish parish, which differentiated it from the other close by parishes like the former St Vincent De Paul (the building is now The Montante Center on the Canisius College Campus) and Blessed Trinity Church (on Leroy Street) which were mostly German parishes. The new parish began June 25, 1908. Almost immediately, parishioners started raising money for a permanent church. In 1914, ground was broken; work was completed the next year. The statuary near the altar of the current church– likenesses of Jesus, Mary, Joseph and Anthony– were the only artifacts that made their way from the original church to the current building. It was at this time that the rectory, a wooden frame Parkside Home that predates St Mark’s, had a stone facade built up, to give it the same look as the church. St. Mark was different from other new parishes of the time, in that the parishioners built a stand alone church first without a school. Many new parishes of the time, like North Buffalo neighbors St Margaret’s and Holy Spirit, built combination church/schools, with the church on one floor, the school on another. Parishioners settled on waiting a few years for a school, which was built in 1920-21, and still stands today. That first pastor, Father McMahon, would spend 20 years at St Marks, until he was named the Bishop of Trenton, NJ in 1928. Presbyterians also have a long history in Parkside. A long time neighbor at Main Street and Jewett Parkway, Central Presbyterian Church was founded in 1835 by a group of 29 folks looking for a more conservative theology than that which was being presented at the more liberal “new school” First Presbyterian. They organized as Pearl Street Presbyterian, and their first church was a large log cabin just north of Genesee Street. Under the 38 year leadership of their first pastor, The Rev. D. John C. Lord, the church remained the only “old school” church in the area. A new church was built in 1837, then another in 1852, at the corner of Genesee and Pearl Streets, on the site of the current Hyatt Hotel. 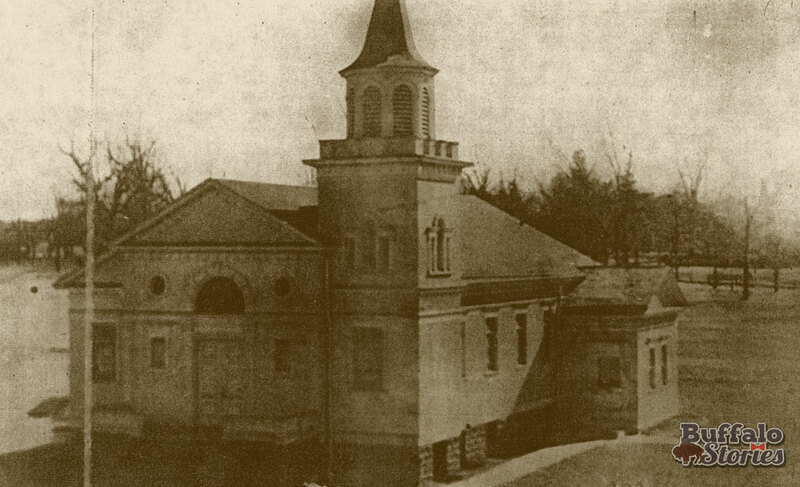 While by 1900 the membership had grown to over 600, the quick turnover of several ministers, and a 1906 fire at the Pearl Street home of Central Presbyterian Church left the congregation with a rapidly dwindling number, and in some financial difficulty. 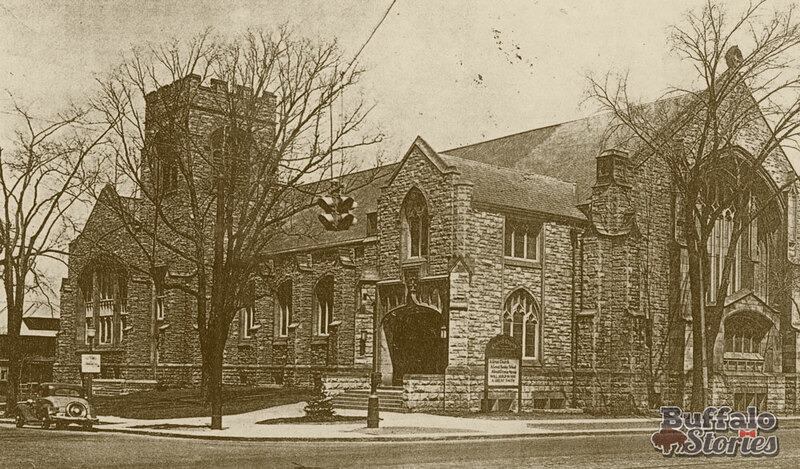 Park Presbyterian Church was organized in Parkside in 1893, and worshipped at Parker’s Hall at Main and Oakwood Streets. A small church was built on Elam Place in 1897. 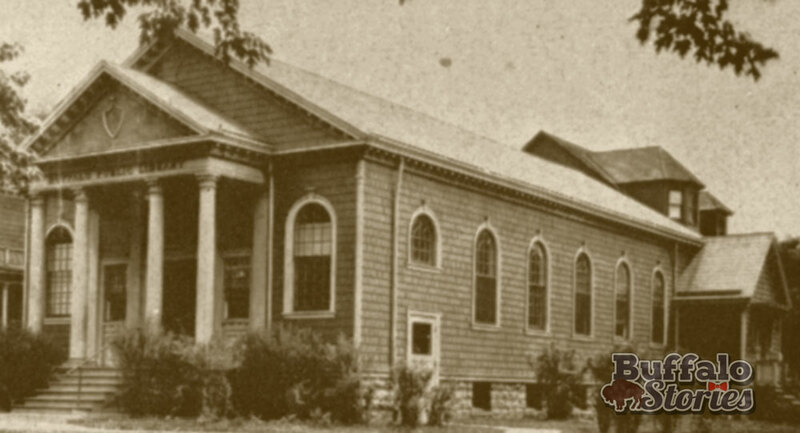 Currently the home of Refreshing Springs Church, in 1909 the building was Park Presbyterian Church. The explosive growth was almost immediate. By 1926, only 14 years later, the numbers had swollen to an amazing 3,378. The relatively new building had to be enlarged to fit the larger flock. The almost inconceivable plan to do so was so incredible, that the producers of MovieTone News shot the feat to be included in news reels all around the country. The stone facade of the church was moved 40 feet closer to Main Street, all in one piece. A new pastor, The Rev. Dr. Robert MacAlpine, and his charming personality were largely responsible for the growth. 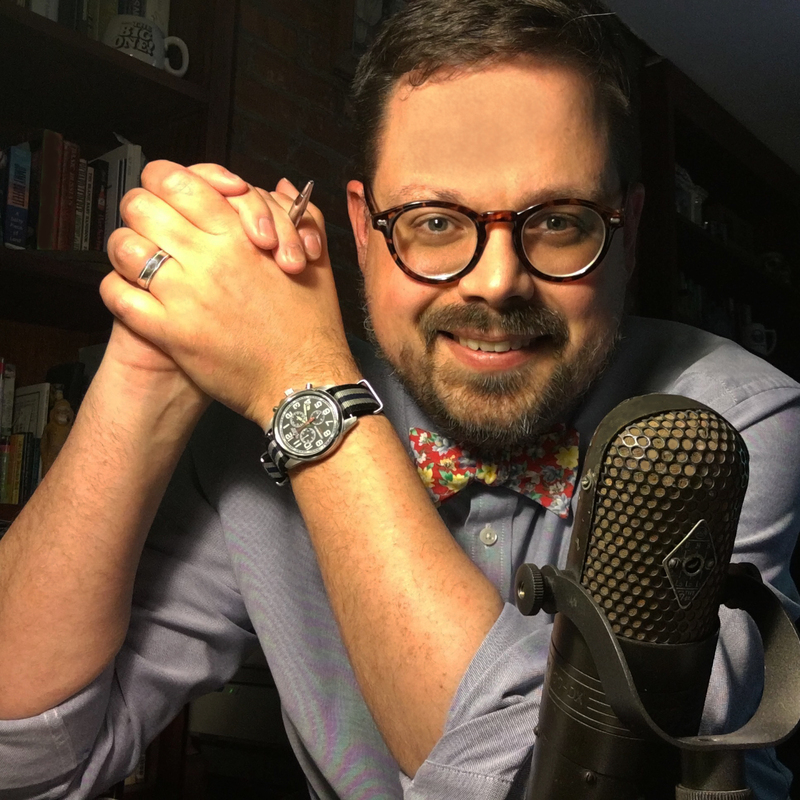 MacAlpine had radio broadcast equipment installed in the church at a time when the medium was still a novelty, sending his voice and message near and far to those listening on “wireless sets” all over Western New York, inspiring them to come to Sunday Services at Central Pres. Ten stained glass windows were added in 1940, in 1957, the school building was added behind the church.